We’d love your help. 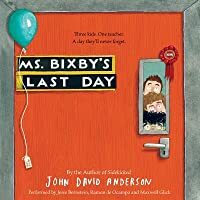 Let us know what’s wrong with this preview of Ms. Bixby's Last Day by John David Anderson. Everyone knows there are different kinds of teachers. The good ones. The not-so-good ones. The boring ones, the mean ones, the ones who try too hard. The ones you’ll never remember, and the ones you want to forget. But Ms. Bixby is none of these. She’s the sort of teacher who makes you feel like the indignity of school is worthwhile. Who makes the idea of growing up less t Everyone knows there are different kinds of teachers. The good ones. The not-so-good ones. The boring ones, the mean ones, the ones who try too hard. The ones you’ll never remember, and the ones you want to forget. But Ms. Bixby is none of these. She’s the sort of teacher who makes you feel like the indignity of school is worthwhile. Who makes the idea of growing up less terrifying. Who you never want to disappoint. What Ms. Bixby is, is one of a kind. Topher, Brand, and Steve know this better than anyone. And so when Ms. Bixby unexpectedly announces that she is very sick and won’t be able to finish the school year, they come up with a plan. Through the three very different stories they tell, we begin to understand just what Ms. Bixby means to Topher, Brand, and Steve—and what they are willing to go to such great lengths to tell her. To ask other readers questions about Ms. Bixby's Last Day, please sign up. What is the song played at the beginning and end of the audiobook? First things first: I will admit I had a hard time starting this book, because I've lost way too many loved ones to cancer. I had to read the first 40 pages through almost-closed eyes. I don't tend to gravitate to cancer stories because they're not generally where I find pleasure reading. But boy oh boy am I glad I stuck with this one. MS. BIXBY'S LAST DAY is so well done, so good, with hints of the full story dropped just so, so you have to keep reading, and utterly real and believable characte First things first: I will admit I had a hard time starting this book, because I've lost way too many loved ones to cancer. I had to read the first 40 pages through almost-closed eyes. I don't tend to gravitate to cancer stories because they're not generally where I find pleasure reading. But boy oh boy am I glad I stuck with this one. 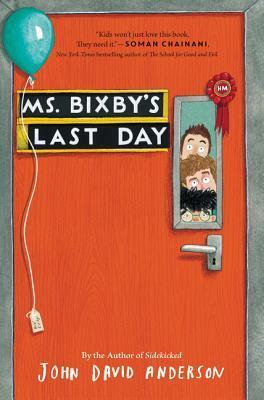 MS. BIXBY'S LAST DAY is so well done, so good, with hints of the full story dropped just so, so you have to keep reading, and utterly real and believable characters. It's impossible not to fall in love with Topher, Steve, and Brand, and, of course, with Ms. Bixby. Brand, Topher and Steve are enjoying their year in school because their teacher, Ms. Bixby, is one of "the good ones". She listens to her has her fair share of quirks, like working part time as a clown, having a pink streak in her hair, and spouting quotations. When the boys find out that Ms. Bixby is sick and has to finish the year early, they take some consolation in the fact that they can give her a good "last day". When her cancer treatment doesn't go well, and she ends up in the hospital, the three decide to skip school, gather the ingredients for a celebration, and make their way to the hospital to visit. They have manage to locate her favorite (very expensive) cheesecake, have quite the adventure getting a bottle of wine, and after several disaster, make it to the hospital. During the course of these events, we find out more about why Ms. Bixby was such an influential person in the boys lives, which are far from easy. They even manage to get Ms. Bixby out to a park, where they share their celebration. While this is a sad book which made me cry, it also has a healthy does of humor. Brand, Topher and Steve manage to get themselves involved in a lot of realistic trouble. When they skip school, they make sure that they call into the attendance office in a realistic way. When they try to buy a bottle of wine, they approach an older man to say that they are his nephews, and he then runs off with the money. Dangerous? Yes, but something I can see middle school students doing. The relationship between Ms. Bixby and each boy is slowly revealed. We find out that she is helping Brand through a very difficult time, and why she is so important to Steve and Topher. We also learn a lot about the interplay between the boys, and there are some altercations when they become frustrated with each other. Even briefly mentioned relationships ring true-- when they run into Steve's sister at a McDonald's, Steve deftly counters her threat to tell their overly involved parents with an equally effective threat about her own behavior. This encounter tells us volumes about the family dynamic and adds a layer of depth to the characters. Anderson tugs at our heartstrings with this one, but he is also true to his own style by inserting guffaw-inducing descriptions of the cheesecake after it has spent time in a backpack, comic chase scenes, and even some terribly sophisticated booger humor. This makes it a perfect book not only for adults who are fond of reading books like Wonder, The One and Only Ivan and Almost Home that require boxes of tissues to be kept at the ready, but also for middle school readers who enjoy slapstick humor. Not many books manage to balance the two, but Ms. Bixby's Last Day does so artfully. Incredible moving. Hits all the right notes--funny, tender, and thoughtful. filmler beni daha çok ağlatır, herhalde görselliğin etkisiyle çok daha çabuk duygulanırım. ağladığım kitaplar da çoktur elbette, hatta hüngür hüngür ağladıklarım da vardır. bu kitap da onlardan biri oldu. öğretmen olmam, hayatta en çok öğrencilerimin beni "iyi" bir öğretmen olarak hatırlamasını istemem ve geçen yaz bir çok sevilen bir öğretmen arkadaşımızı erken yaşta kanserden kaybetmiş olmamız... sanırım bu üç etken şu an gözlerim şiş şiş oturmama neden oldu. öğretmenliğin ileride şimdiki önemi filmler beni daha çok ağlatır, herhalde görselliğin etkisiyle çok daha çabuk duygulanırım. ağladığım kitaplar da çoktur elbette, hatta hüngür hüngür ağladıklarım da vardır. bu kitap da onlardan biri oldu. öğretmen olmam, hayatta en çok öğrencilerimin beni "iyi" bir öğretmen olarak hatırlamasını istemem ve geçen yaz bir çok sevilen bir öğretmen arkadaşımızı erken yaşta kanserden kaybetmiş olmamız... sanırım bu üç etken şu an gözlerim şiş şiş oturmama neden oldu. öğretmenliğin ileride şimdiki önemini kaybedeceğinden eminim ama bizimki gibi üçüncü sınıf ülkelerde hâlâ iyi bir öğretmen bir çocuk için en büyük şans. bu kitapta da amerika'da (birçok açıdan üçüncü sınıf ülkelere benzediğini biliyoruz elbet) üç farklı çocuğun kalbine dokunan bir öğretmen çok ince detaylarla, esprilerle anlatılıyor. hastalanan öğretmenleriyle son bir gün geçirmek istemeleri ve o gün anlatılıyor aslında ama bir günde geçen roman bayan bixby'yi çok derin bir biçimde tanımamızı sağlıyor. She saw the little things. And she made that matter. Love . . .Love . . .LOVE!!! Quite possibly the B*E*S*T chapter book I've ever read!! Oh, and funny????? OH MY, YES! There were moments I laughed so hard I couldn't see for my tears. And there were a few somber tears too. Whether nine or ninety, this book is perfectly suited for a wide range of readers. Most everyone clearly remembers a favorite teacher, "one of the good ones" like Ms. Bixby, who sparkled with that little something extra. And we can recall friendships we forged, quirky and fun, deep Love . . .Love . . .LOVE!!! Whether nine or ninety, this book is perfectly suited for a wide range of readers. Most everyone clearly remembers a favorite teacher, "one of the good ones" like Ms. Bixby, who sparkled with that little something extra. And we can recall friendships we forged, quirky and fun, deep and abiding; people who journeyed with us on adventures to adulthood. This is a story about friendship, learning to fit in, courage, rising above, blending in, standing out, and learning that you have valuable talents and skills to offer this world that have nothing to do with sitting at the cool kids table. Additionally, this is a story about what it means to give selflessly to the benefit of others; others which include those who might have nothing to give because they have already given their all. Destansı yol hikâyeleri edebiyat ve sinemanın önemli bir kolunu oluşturur; hatta içinde “yol” barındırmayan birçok anlatı bile “kahramanın yolculuğu” denilen bir serüveni tasvir eder. Kısaca bahsetmek gerekirse, bu anlatılarda başkahraman bir şekilde yola çıkar, başından geçen bir dolu olaya göğüs gerer ve sonuçta bu olaylar onu (ve varsa yoldaşlarını) değiştirir. Finale, yani hedefe vardığında da kahraman artık daha güçlü, daha idrak etmiş, daha olgunlaşmıştır. "Yüzüklerin Efendisi"nden "Matrix Destansı yol hikâyeleri edebiyat ve sinemanın önemli bir kolunu oluşturur; hatta içinde “yol” barındırmayan birçok anlatı bile “kahramanın yolculuğu” denilen bir serüveni tasvir eder. Kısaca bahsetmek gerekirse, bu anlatılarda başkahraman bir şekilde yola çıkar, başından geçen bir dolu olaya göğüs gerer ve sonuçta bu olaylar onu (ve varsa yoldaşlarını) değiştirir. Finale, yani hedefe vardığında da kahraman artık daha güçlü, daha idrak etmiş, daha olgunlaşmıştır. "Yüzüklerin Efendisi"nden "Matrix"e, "Kayıp Balık Nemo"dan "Oz Büyücüsü"ne kadar uzanan geniş bir yelpazedeki birçok eser bu izleği kullanır. Hatta karakter odaklı sanat eserlerinin başarısı burada yatıyor bile denebilir. Amerikalı yazar John David Anderson’ın ödüle doymayan romanı "Üç Çocuk, Bir Öğretmen ve Unutulmaz Bir Gün" de tam olarak bu düsturu benimsiyor. Özetle, hastalanan öğretmenlerine harika bir gün yaşatmak amacıyla yola çıkan üç ufaklığın başına gelen bir dizi trajikomik olayı ele alan kitap, karakterlerini eğlenceli olay örgüsünün içine cüretkârca atıyor ve şehrin keşmekeşinde onları şöyle güzelce bir sarsıyor; hem onları hem de okuru. Steve, Topher ve Brand, çok sevdikleri, çok önemsedikleri öğretmenleri Bayan Bixby’nin uğruna, aslında hiç başlamamaları gereken bir serüvene atılıyor. Sıradan bir yetişkin için dünyanın en sıradan seyahati olan bu gündelik patika, şehir insanlarının dünyasına adım atmak zorunda kalan üç adet hobbit için hayatlarının yolculuğu haline geliyor. İşin kötüsü, bu üç hobbit bile kendi içinde son derece farklı. Hepsinin kendine has kaygıları, düşünceleri ve emelleri var. Ve yazar bunu bize başarıyla, sanki üç çocuğu gerçek hayatta gerçekten tanıyormuşçasına aktarıyor; her birinin kendi üslubu, kendi kelimeleri, kendi hisleriyle ve başarıyla. Bir de Bayan Bixby var tabii; tüm bu hercümercin yegâne kaynağı; genç, güzel, idealist, sevgi dolu ve pembe saçlı bir öğretmen. Öğrencilerinin onu bu denli sevmesi hiç şaşırtıcı değil, çünkü yaratıcı ve itinalı bir öğretmenin çocuklar üzerindeki etkisini anlamamak güç oluyor kitabın paragraflarında. Romanın en güçlü yönü, aynı zamanda yumuşak karnı: Bir hastalık. Yani gezindiği sular bir hayli tehlikeli aslında, her an bir çukura düşüp anlatısını tamamen değiştirebilir. Fakat John David Anderson bu tuzağa yaklaşmıyor bile. Ne bir gram duygu sömürüsü var kitapta ne de tek bir cümle klişe. Gücü de işte, tam olarak burada: Sahip olduğu müthiş duygusallık, kitabın içinde bir yerlerde saklı ve kesinlikle açığa çıkmıyor; ancak çıkmasa da, bir evin duvarlarından sızan rutubet gibi, kalbinize ve beyninize minik his partikülleri bırakmayı başarıyor. Hiç anlamadığınız bir anda, saçma sapan bir maceranın ortasındayken gözleriniz dolabiliyor ya da sömürüye en açık sahnede asfalyalarınız bir anda gevşeyebiliyor, kahkahayı koyuveriyorsunuz. Bir başka parantez de üslup için açılmalı: Yazar hiçbir şekilde kolaya kaçmıyor, yani bir tane anlatı biçimi benimseyip onun yolundan gitmiyor. Mesela Brand’e sürekli yeni kelimeler bulduruyor, Steve’in birçok kavramı –ve de filmi– birbirine karıştırmasına izin veriyor, Topher’ınsa engin hayal gücünü ulu orta göstermesini adeta istiyor. Bu zenginlik de elbette, kitabın mecazi sayfa sayısını bir hayli artırıyor. Yani Brand’in deyimiyle, yazar bir an bile "avallamıyor." I reread this book for our discussion this afternoon in our kids book group. I cried just as much at the end as I did the first time I read it. I love this book so much and have recommended it to teachers, parents, and students time and time again. My original review from two years ago follows below. I seem to agonize over writing reviews for the books that I loved. I want to say all the right words to let people know how special the book was to me, but then months go by and I still can't seem to I reread this book for our discussion this afternoon in our kids book group. I cried just as much at the end as I did the first time I read it. I love this book so much and have recommended it to teachers, parents, and students time and time again. If you read one book this year, and we're more than likely not Goodreads friends if you only read one book a year, read this one! Dear John David Anderson, pleeease keep writing realistic fiction. This one will stay with me for a long time. I hope I'm one of the Good Ones. Well, this made me bawl my eyes out. So I have to give it five stars. Topher, Steve and Brand are sixth graders. They're the target of bullies, but they're also resilient and fun dudes. Topher is an artist with a wild imagination. Steve is a little like Spock, super logical and intelligent. Brand thinks there's nothing special about him, but the fact that his dad is disabled means Brand has taken on a lot of adult responsibilities, making him especially determined and capable. These three friend Well, this made me bawl my eyes out. So I have to give it five stars. These three friends each tell part of the story in turn. They go on a kind of quest to see their teacher Ms. Bixby in the hospital. It is, of course, part adventure and part comedy of errors. They have to skip school, take a bus into the city, and procure certain items, at least one of which is illegal for minors to purchase. The heart of this story is each boy's connection to Ms. Bixby. She is a Cool Teacher (http://tvtropes.org/pmwiki/pmwiki.php...) but it doesn't play like a stereotype. She gives each of these three boys what they need and they want to give her something back in her time of need. Like The Great American Whatever, this manages to be both funny and heartbreaking, which is a winning combination like salty and sweet or comfortable and stylish. A perfect book for a 6th grader, just edgy enough not to be babyish (there's a little bit of swearing and just a touch of risque) but not beyond what an average preteen can handle. There are allusions to great poetry, music and literature (you'll probably want to read or re-read The Hobbit after this and go look up Walt Whitman), which is a hallmark of the Cool Teacher. She turns you on to cool stuff. Is it a drawback that Steve's character calls on a certain Asian-American stereotype? He has tiger parents and a perfect sister who's a pianist. In popular culture Asian people tend to be portrayed as logical, good at math, and socially reserved like Steve. But Steve is a well-developed character with a rich inner life. He is not just a series of stereotypical traits. Maybe his parents are, though. I'm not sure where I ultimately come down on this but I mention it because I'm sure there are readers who are tired of seeing this stereotypical set of attributes. But I did love Steve. To get into spoiler territory: (view spoiler)[ I thought there was a subtle implication that Steve is gay and feels more than just friendship for Topher. That definitely shades his character, right? To be 12 and dealing with an attraction to your straight BFF? That would explain being reserved in how you express your emotions. (hide spoiler)] And I liked what the author did with Steve's relationship with his sister. Well, the beginning is trite. And the whole concept panders to those who consider themselves 'good teachers' and will buy the book for their kids. And there's plenty of discussion themes, and bibliotherapy tags. Also it's full of stuff that will alert those who want to keep interesting books away from kids, so it will get on Banned Books lists, giving it more notice and cachet. So, cynical me says it's overrated. But. It's engaging, and original, and gets better and better until the end at which Well, the beginning is trite. And the whole concept panders to those who consider themselves 'good teachers' and will buy the book for their kids. And there's plenty of discussion themes, and bibliotherapy tags. Also it's full of stuff that will alert those who want to keep interesting books away from kids, so it will get on Banned Books lists, giving it more notice and cachet. So, cynical me says it's overrated. But. It's engaging, and original, and gets better and better until the end at which point I'd fallen under its spell. Anderson knows boys. He knows how to write. He knows how to use science, classic culture, and pop culture references to make a book that will have appeal to any audience, now or in the future. So, avid reader me says it's a delight. Told from three points of view, we meet Topher, Brand, and Steve. And these friends' teacher, Ms Bixby, is one of the good ones. She's a teacher that has made a huge impact on their lives. She's one of the ones that will be remembered, that has shaped their lives for the better. And she's sick. And she skipped out on the last few days of school before she started her treatment. And these guys are not going to end the year without telling her goodbye. Without giving her a day to remember. As they Told from three points of view, we meet Topher, Brand, and Steve. And these friends' teacher, Ms Bixby, is one of the good ones. She's a teacher that has made a huge impact on their lives. She's one of the ones that will be remembered, that has shaped their lives for the better. And she's sick. And she skipped out on the last few days of school before she started her treatment. And these guys are not going to end the year without telling her goodbye. Without giving her a day to remember. As they set off to give Ms. Bixby a day to remember, we get glimpses into the year, into their lives, and why Ms. Bixby is so important to them. Thanks goodness I read this book. I cry way too easily when I read books like this, and now my cheeks are wet and I want cheesecake and french fries. My favorite character was definitely Brand. I loved the way he had a super close relationship with Ms. Bixby. I’m also happy that his dad had the courage to get up and drive. Bottom line is, I loved this book. Wow. That’s all I can say. Wow. This book was amazing, A-MA-ZING. I actually found out about this book through Audible and I read it, and I loved it. UPDATE: I'm currently listening to the audiobook and it's everything I'd hoped it be. This book is as close to perfect as anything I've read in awhile. The character's narratives are as if they are speaking right into your ear. The book's voice is clear and charming. I will recommend this to all! I loved it so much. Gözyaşlarıyla unutulmazlar rafına kondu. Z.O.Ç.K.O' yu iyi ki geçen yıl yayımlamışız dedirtti bana. Sanırım dünyadaki tüm " çocukların ne yaptığını değil ne hissettiğini düşünen öğretmenler" aynı şeyi yapıyor. One of the BEST MG novels I've read in a long time. This was such a good book. Beware, may cause major sobbing towards the end. Very sweet story about three middle school students who are on a mission to make their dying teacher's last day memorable. This book is one of the good ones! I have to admit. I was slightly terrified to start this novel. The title alone can be interpreted as something to spark tears, but I fell in love with the heartfelt humor of Ms. Bixby's Last Day after reading the first few pages. Topher, Steve and Brand are characters you want to get to know and root for during their entire adventure, and Ms. Bixby inspires kindness. I recommend this book to students, teachers and parents. This book took a while to get into, but it does get really good. The three boys go a ton of places just to go visit their teacher and make her day better. This book is really good and I would recommend it to people in 6th grade and above. I can't remember the last time I laughed so hard and cried so hard in one book. I took my time getting through this because I knew the end would devastate me. Those three boys! Those three endearing, infuriating, wonderful boys! John David Anderson's writing brings about strong voice and emotion throughout the entire text in such a humorous, humorous, engaging tact. As a teacher of fourth grade, I loved reading this and was thinking a lot about how it would engage our students. This was an absolutely fantastic book. It's a story of friendship, love and loss and the journey of life we're all on. It's not about the first day or the last day but all the days in between. This is technically a children's book but people of all ages should read it. Made me cry in the best way. This was a really good, sad, heartbreaking, sad, sad story, and I loved it so much. Everyone needs to read it! John David Anderson once hit himself so hard on a dare by his sister that he literally knocked himself out of a chair and nearly blacked out. He has since translated this passion and singularity of purpose to the related arts of novel writing and pizza eating. The author of STANDARD HERO BEHAVIOR, SIDEKICKED, MI Librarian Note: There is more than one author in the Goodreads database with this name. “Everybody loves a good sob story, so long as it's not their story.